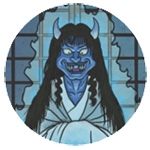 APPEARANCE: Myōbu are celestial fox spirits with white fur and full, fluffy tails reminiscent of ripe grain. They are holy creatures, and bring happiness and blessings to those around them. INTERACTIONS: Myōbu statues are most often found at Inari shrines, taking the place of the koma inu which adorn other shrines. These foxes act as both guardians and symbols of good luck and blessing. People often leave offerings of holy sake, sekihan (red rice and red beans), inarizushi, and fried tofu at these shrines. These foods are all said to be foxes’ favorites. ORIGIN: Foxes were considered holy animals since long before recorded history began in Japan. The farmers of ancient Japan revered foxes, which preyed on the mice and rats which destroy crops. Foxes have long been associated with Inari, the god of the harvest. 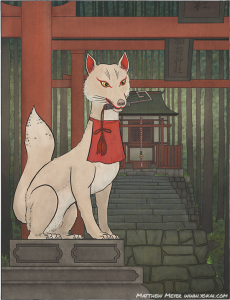 Inari is said to use foxes as servants and messengers, and the majority of the foxes in his employ are the holy, white-furred kind known as myōbu. Myōbu statues are commonly found at Inari shrines. They often carry sacred objects in their mouths, such as the round jewel often carried by koma inu in other shrines. Myōbu can also be seen carrying spiral keys, sheaves of grain, and scrolls. These all carry special significance in Inari worship. The round jewel represents both the soul of Inari, and its form is a symbol of a grain storehouse. The spiral key is an archaic design of the keys used with traditional farm warehouses. The key represents the desire to unlock the storehouse; i.e. soul of Inari. The sheaves of grain represent the five grains (wheat, rice, beans, awa millet, and kibi millet) which are important in East Asian traditions. Finally, the scroll represents knowledge and wisdom.